Editor's Note: This interview provides a unique glimpse into the ancient tradition of iaijutsu -- the art of drawing and cutting with a Japanese sword, a razor sharp curved blade that requires tremendous skill and strength for proper control. The interview covers many subjects including: history of the art, practice of kata, methods of transmission of knowledge, kata applications, and training in Japan. One doesn't expect to encounter traditional Japanese culture in America's Heartland, but that's what you find in a quiet, residential neighborhood in East Lansing, Michigan. In an old house, built by his father, Michael Alexanian lives with his wife, Dianne. Together they are directors of Shakunage Consulting, Inc. The company's mission is to "promote, nurture and develop awareness of Japanese Culture" through the study of various Japanese arts and traditions (www.shakunage.org). The house is filled with Japanese art objects, surrounded by a beautiful Japanese garden. On the grounds one also finds the Shakunage Tei, a small pavilion which serves as a classroom for traditional arts - flower-arranging, tea ceremony, calligraphy. 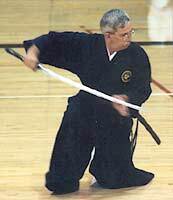 The Shakunage Tei also serves as the dojo for the North American branch of Tamiya ryu Iaijutsu, a classical koryu (classical) style of swordsmanship. I first met "Mike Sensei" at the Guelph (Ontario) School of Japanese Sword Arts, a sort of "summer camp" for people interested in getting a sample of various traditional Japanese blade arts. His friendly manner put me at ease and we got along well from the start. I was also impressed with the way he wore formal keikogi (martial arts uniform jacket) and hakama (skirt like pants with seven pleats, traditionally used by the Japanese warrior class and later adopted within martial arts) for the Saturday night demonstration (elegance is not something often encountered in martial arts). Intrigued, I took a seminar in Tamiya ryu Iaijutsu one year at Guelph, and found there was a lot that was of interest to me as a practitioner of Muso Shinden ryu iaido (iaido like iaijutsu is the art of drawing the sword but with greater emphasis on spirutal goals). Tamiya ryu is an earlier style than ours, but is considered to be part of our line of development. I could see a number of similarities between the two styles in the way the sword was drawn and handled. In November of 1999, my instructor Phil Ortiz and I visited Mike Sensei and Dianne in East Lansing, where we spent the weekend training and talking (and watching martial arts videos). The following summer, in June, I asked Mike Sensei if he would sit for an interview, which he did. Michael Alexanian: I began about 11 years ago, in 1989, studying Toyama Ryu Batto Jutsu or Toyama Ryu Iaido, as it is sometimes known. It's an interesting story as to how it all came about. The Christmas of 1989 my wife gave me a set of katana (Japanese swords) and wakizashi (a short sword-like knife) for display in our home. I had always been fascinated with military arts, even when I was a child, reading The Legends of King Arthur, and about samurai and things like that. So she got me this very beautiful set of swords, and a gentleman who was doing some gardening for us happened to notice them in our home. He had seen a little flyer on a kiosk at nearby Michigan State University advertising a Japanese sword club. Out of curiosity I went one night, and that was it: I got hooked, as often happens with such things. Not long after that, my wife Dianne also attended the class, and she got hooked too. So for the next four years we became students of Nathan Banks Sensei and Toyama Ryu iai. His sensei, Niikura Katsumi, from Sterling Heights in Detroit was kind of our overseer. He was the one who conducted all the testing and arranged major events from time to time. What is Tamiya Ryu Iaijutsu? That was very interesting and made a very nice complement (or balance) to what we were doing with the sword arts. This particular style of jujutsu, which is an old Okinawan style, also utilizes some weapons techniques - mainly jo (a 4" staff) and a special yawara stick (a short stick) - which is kind of unique to the school. There was also a little bit of sword work as well, so it was an eclectic sort of style. In 1993, we made our first trip to Japan as part of the Michigan-Shiga Sister State Program Goodwill Mission Cultural Exchange, whereby citizens from Sister Cities in Michigan go over to visit their respective Sister Cities in Shiga Prefecture. We took a couple of extra weeks on that trip and visited some friends of ours in Yokohama. They, in turn, introduced us to our current Sensei, Tsumaki Kazuo, whose father is the current and 14th headmaster of Tamiya Ryu Iaijutsu. His name is Tsumaki Seirin Motonobu Soke. Since 1993 up to the present, I've been a student of both Soke sensei (soke is a hereditary headmaster of a martial arts tradition) and Tsumaki Sensei. DKB: What particularly interested you about Tamiya Ryu as a sword style? MA: As a specific style of iai, one thing that impressed me very much about comparing Toyama Ryu and Tamiya Ryu - this can be confusing because the names sound almost similar. It's very interesting to note that many of the Tamiya Ryu sensei in Japan and the Shibucho (branch managers) also once studied Toyama Ryu; but they found, as I believe happened with myself and my wife, that the Toyama style was much heavier on the military aspects of swordsmanship, being of course the style that was developed for the Toyama Military Academy. We found the overall emphasis in the Toyama style to be more on the philosophy of what we call satsujin no ken or "the sword which takes life." Tamiya Ryu on the other hand emphasizes what we call katsujin no ken or "the sword which gives life." One of the key philosophical points of Tamiya Ryu is that we do have a very high level of respect for our opponent - our enemy. We do try to preserve our opponent's life as well as our own in the course of our training. Another aspect of the Tamiya school that I found very attractive is the fact that it does date back. You can trace its lineage back over 400 years to Tamiya Heibei Narimasa or Shigemasa (depending on how you read the kanji, as Soke says in his volume on Tamiya Ryu). Tamiya Heibei Narimasa was the first student of Hayashizaki Jinsuke, who's considered by many scholars to be the founder of modern iaijutsu or Japanese swordsmanship. After a certain amount of training with Hayashizaki Sensei, Tamiya Sensei went on to found the Tamiya style (of course many other students of Hayashizaki Jinsuke went on to found other schools like Muso Jikiden Eishin ryu, Mugai ryu - there's a whole bunch of them listed in the book). I found the fact that it was a much older art than the Toyama style very, very attractive, because of my great interest in Japanese culture, especially ancient Japanese culture. Being able to study an art form - and truly iaijutsu is an art form in many, many ways - to be able to study something that old, which has remained virtually unchanged for those four centuries, is wonderful. Also, to be the first American, as I found out later, who was even allowed to begin training in this particular style was a real honor. I can't say "the first Westerner" because there is another gentleman in France who preceded me, but as far as America goes, to my knowledge I am the first American. In addition, it just so happened that when we met Tsumaki sensei and realized his father was the grand master, it was very, very special, because in many schools of martial arts, the instructor has maybe third, fourth, or even fifth-hand knowledge of the techniques and training. Maybe he learned from a guy who learned from another guy who learned from another guy who learned in Japan. In the case of our particular school, Tamiya Ryu, having the advantage of having Tsumaki sensei as my instructor makes a nice, direct transmission from the top right down to me and my students. There's no mixup or miscommunication or diluting of the pure style. Another point too that attracted me to Tamiya Ryu is the fact that it is what I consider to be a very pure style of iai. It's not a hybrid like some others. Toyama Ryu, in fact, if I understand correctly, was sort of an amalgam of three or four different ryu where the founding teachers took certain elements and blended them all into one. I also find that the Tamiya style is much more - maybe elegant is not the right word to use - but very refined and very respectful in many ways. We have a lot of etiquette points that are very important, especially during a testing situation. Whether it's in Japan or out of the country, the etiquette is looked at just as carefully as the performance of kata by those who are judging. So I think, you know, a combination of that ancientness or old quality of the art, and the fact that the teaching is very pure and clean, and also that it's a very refined style were several of the things that drew me to it. DKB: Tamiya Ryu is also a forerunner to Muso Shinden Ryu, some of the roots of which I'm still trying to unravel myself. One of the things that attracts me to Tamiya Ryu is the similarity with Muso Shinden Ryu. It clearly harkens back to Tamiya Ryu in a way that Muso Jikiden Eishin Ryu, for example, does not. It's like visiting an ancestor - I can see the family resemblance. MA: It's kind of fortuitous that you should mention that, because in our very first meeting with Tsumaki Sensei in 1993 was an interesting session. Our friend Mrs. Goto arranged for Sensei to give us a lesson that afternoon, so we came fully dressed in our gi and hakama. When he was done instructing us, he asked us if we would show him what we knew of Toyama Ryu, so we did several kata and several kumitachi (two person forms). Then he said something very, very interesting that relates to what you just said. He said, "You know, all iai basically comes from the same place." Most of the old schools of iai, if they trace their lineage back to the very beginning, all run back to 1597 and Hayashizaki Jinsuke and his Hayashizaki Ryu. So even the modern styles have very, very spectral elements of some of the Koryu styles in them. Sensei's outlook, I think, is a very good one, because first of all it eliminates a lot of the competitiveness that tends to exist in many of the martial arts communities or styles. The fact is that we're really studying the same thing, just taking off in a little different direction. Really, when you trace it all back down to the beginning, we're all doing the same thing. DKB: It's like Otani Sensei likes to say, "there are many paths up the mountain." DKB: You get to the top, but there are different ways to get there. One of the things that interests me -you just said that the teaching is virtually unchanged. DKB: I think this sort of has to do with the teaching method - teaching by way of kata. One of the things that a lot of Westerners seem to be skeptical about is the accuracy of teaching through the use of kata. Nowadays we have video tapes and things like that, so everyone assumes the verisimilitude of video tape is better than the sort of body-to-body teaching that is involved with kata. I just wanted to ask your opinion about that. MA: Yes, actually I have a very strong one. I find video tape useful in certain contexts. For instance in our dojo if you walk in you'll notice the conspicuous absence of mirrors, which are usually a standard feature in most dojo or martial arts training halls. In our case we tend to use video to tape our students as they practice kata. Then what we do at the end of the class is reserve 15 or 20 minutes and we all sit down and we review the performance on the tape. Not only so that the one student can see the possible things he may need to correct or to work on, but so that the other students may also see things that the other person is doing, well, that they may need to pick up on, and so forth. But as an actual learning tool, I am very much opposed to the people who say, "You can learn martial arts from video tape." I don't think you can do that. It has been my experience that to really learn any martial art, whether it be karate or kendo or iai, you need to work with a qualified instructor, one who has the ability to transmit the teachings to you. Also, of course, books and video can only go so far. There's a lot of what we refer to as okuden or the oral teachings that you just can't put into books or videos, and you miss all that if you restrict yourself to a media form of learning. I think that really breaks down traditional learning in the Japanese martial arts. There is a video of Soke sensei which is part of the Nihon Kobudo series where he does demonstrate many of the Tamiya ryu kata, and that was very helpful to me. Tsumaki Sensei gave it to me when we returned from living in Japan in 1996. I found that in the absence of having him there to instruct me it was a very nice aid to my learning. Also, in a long-distance learning capacity being able to use video, for instance to tape yourself and send material to your sensei, was very helpful because he would review it and critique it and send it back with copious hand-written notes about what was good and what was bad and so forth and so on. I think video and similar media has its advantages and disadvantages but I see it more as a supplement to real, true experience-based or body-to-body work. I think by and large video is nice for information and perhaps practice review, but I'm very much opposed to people using video as a sole learning tool. We are very lucky today in that many Japanese instructors will let you practice or visit their dojo and take lessons. Not so in the old days, when it was very very difficult for Americans to get into martial arts schools. Even today, in many cases you still have to know somebody. In our case, we knew Mr. & Mrs. Goto, who were friends of Tsumaki Sensei, because Mrs. Goto was teaching his son English for his college entrance exam. When they found we were coming to Japan and that we did iai, they arranged for the afternoon lesson. Meeting Tsumaki Sensei was truly a life-changing experience for both Dianne and myself. When we first saw him perform I actually wrote an article called "Thunder in Yokohama" about that first meeting and had it published in a couple of different magazines. The overall feeling we came away with was just one of such quiet power. The way that sensei taught us - very one-on-one, very personalized transmission of teaching technique - is what I've tried to continue in my style of teaching Tamiya Ryu. I think that our concern is to continue things as much as we can in this modern age the way they were done originally. The way that Tsumaki Sensei has taught me and the information he has passed on is the same basic technique and philosophy that I use to teach my students, and as I witness my students and the regularity of their attendance, they seem to like it. I really would not even hazard to change anything about it at this point in time. DKB: Do you use bunkai (illustration of applications of technique) when you teach? MA: Yes. Especially in a school which is predominantly kata- or form-based, bunkai for us is very, very important. When I instruct or teach a new kata for instance, first of all, I will demonstrate how the kata is done at full speed, medium speed and slow speed, so the students get an idea of what they're going to learn. Then we demonstrate what the kata is for. My senior student and I perform the actual real-life situation that the kata is based on. Then from there we break down the kata numerically into different steps that can range anywhere from 15, 16 or 20-plus individual motions. The bunkai adds an element of realism to learning the kata. For most of us, if we just learn certain movements, we really don't have a visualization in our mind what they're supposed to be used for. With bunkai you can have a little "mini movie" in your mind of what's going on on the other side of what you're doing, and that's most helpful. It helps to reinforce remembering the kata, not just sequentially but in random order as well. DKB: ...That's what happens when you teach. DKB: This is kind of a funny question but it's something that people are often interested in if they've never trained in Japan. Could you describe a typical training session with Tsumaki Sensei in Japan? MA: Certainly. A typical training session for us usually ran from six to eight hours in a day. It was usually one big solid day of training when we were visiting Japan. When we lived there we would visit Yokohama and stay for three or four days in which case we would break it up. First of all, training consisted of very long days when we were in Japan. It was the month of August so it was very hot. I have a lot of memories of hot and sweaty training. DKB: My favorite training month. MA: Absolutely. But it feels so good when you're done. You sweat out all that bad stuff and everything. We would usually begin with just some warm-up exercises, wrist stretching, things like that - just five or ten minutes. The rest of time was spent mainly going through kata. 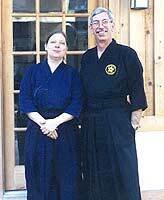 The last time I was with Tsumaki Sensei this past April (2000), the first part of the training session was a review of all of the 11 kata in the first volume. He called out the kata and I and the person I was training with had to perform not necessarily at the same rate, but at our own speed. Sensei first took us through all 11 and then went back and started again with number one and had us do it all again. Then he made certain corrections and wrote them on the blackboard so that I could write down the notes and carry them back to the U.S. and work on them. We did this for all 11 kata. At the end, after we'd gone through all 11 once again with corrections, Sensei went back and reviewed once again. Sensei is a very strong believer in a lot of reinforcement. We spent a lot more time on some of the kata which are particularly difficult, of course, than on others which he thought were coming along okay. It's been my experience with the traditional Japanese martial arts that when you're training with a sensei, if they make no criticisms at all you probably don't rate very highly with them. MA: Because they think something's missing, like maybe your spirit isn't strong enough or maybe your heart, your kokoro isn't in it. They'll say, "Oh, that's fine, you're doing well, see you sometime." But if a Japanese sensei really cares and really sees in you something of value that he can nurture and build on he will be brutally merciless to you and he'll criticize everything. I remember one circumstance when we were training with a group of Japanese university students. Sensei didn't particularly like my final performance at the training session and just tore me to pieces in front of everyone. I think a lot of Americans and Westerners would be very discouraged. They would walk away and think "Oh, my sensei doesn't like me anymore, blah blah blah," and they would quit. But if you take it in the spirit in which it's intended (as constructive criticism), then he's saying these things not to upset you or to make you angry but to make you a better person. Sensei is very much like that when we train. He can hammer and hammer and hammer - not literally, of course - but he can really work on a point until he feels you've got it right or until he feels you've gotten to the saturation point and he has to move on to something else and will come back to it. One aspect I liked about Tsumaki Sensei's training sessions was that we would take a break every hour (of course it being a very hot time of year we had to), and we would sit and discuss the things we just trained in. He would ask, "Do you have any questions? Do you understand what we're doing and why we're doing it?" This is one important lesson I've learned from Tsumaki Sensei in passing on Tamiya Ryu to other people: in a sense the more you know the more proficient you can be in a kata. This is not just knowing the physical motions - being able to mimic someone going through the kata - but to actually understand why you are doing certain things. Why do you draw the sword and leave it vertical until the very last moment when you turn the sword horizontal and draw for the nukitsuke? Little points like that Sensei is always very careful to explain. I would say in a typical six- to eight-hour training session maybe one to two hours of that may be actual verbal instruction or explanation of techniques. You know, if you think about it, in today's world many karate dojo and other martial arts schools rely so much in many ways on mimicry. You know, they say "watch the instructor, do what he does," which can be fine, but if you don't know why you're doing it, you're just mimicking. There's going to be an element missing. I think for us, in Tamiya Ryu, and I've had long discussions with Tsumaki sensei about this, what we really try to do is combine the mind and the spirit and the body to work together. Mind in the sense of understanding academically what you're doing. The body - getting the body to work with the mind and correspond to the things you've learned. Of course the most important part, the heart or the spirit, the kokoro, is in knowing that this is a very old and respected art, respecting all its traditions and doing your best within yourself to honor Tamiya Ryu, not only in the dojo but in your daily life as well.